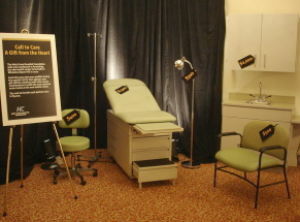 This is an fund-a-need display from a hospital foundation gala. Many auction ideas can help you raise cash, but no other singular activity during your benefit auction will have more financial impact than the cash appeal. It can be such a cash cow that some of my clients have no live auction; they only conduct an appeal. The appeal goes by various names: fund a need, gift from the heart, or any of these other cash appeal names. Whatever you call it, there is a strict protocol to follow if you want to be successful. Here are seven pointers to executing a great fund a need. 1. Select a single item or cause to fund. You will confuse your audience if you have a laundry list of activities or items. I saw an appeal flop at one school because they insisted on raising money for three items. Some members of the (tipsy) audience became confused and thought they could choose which item they got to fund. Ugh! Keep it simple by keeping it singular. Just as you would advertise a silent or live auction item, you should advertise the appeal. Talk it up prior to the gala… put it in your catalog … highlight it in your program … ensure it has its own display table in the silent auction (see photo). Showcase it. This can be conveyed in a heart-wrenching video, a heart-warming live testimonial, or via a short plea from someone close to the need who can succinctly describe its impact. Guests need to understand where the money is going, and how it will help the cause. As of late, I’ve been asked to convey the need on behalf of the charity. This approach can work, too, if you’ve got the right auctioneer. 4. Offer several different pledge levels so everyone can participate. The appeal is the “group gift” of the gala, but not everyone is going to be able to give at the same level. By offering four to six different levels of pledges, you ensure everyone in your crowd can give and feels good about it. 5. Begin by asking for the most amount of money (your highest giving level), and end by asking for the least amount of money (your lowest giving level). This is simple psychology. Asking a guest to pledge $100 seems a modest request after they have just witnessed other guests pledging $1000. 6. Ask auction guests to raise their bid card to make their pledge public. With few exceptions, public pledging will raise more money than silent pledging. 7. Announce the total of what was raised. Guests are always curious about the total, and my experience has been that even when the money raised hasn’t been as spectacular as privately had been hoped, guests don’t know it. “Wow, we raised $25,000! ” a guest will tell me (even though we hoped for $35,000…). Announcing the total inspires guests; they feel good about their participation. You’ll likely even collect a few more donations as guests check-out. And now that you’ve got “the basics”down, what about the rest? What about examples of great videos that have been used as introductions prior to the Fund a Need? What about the sample scripts I’ve used in front of groups? What about the 3 types of Fund a Needs, and learning when to use which? You can learn all of that (and much more) in Fabulous Fund a Need Secrets. Get the details and see a snippet from the content.